In a lesser movie, Black Panther would be the lone dynamic actor in the film, but writer/director Ryan Coogler’s film had T’Challa introduced among his Wakandan people, with a rich culture and immense technological advancement found within them. Black Panther allowed a long list of black actors to shine with each of their characters, instead of perpetuating a culture where only room for one or two actors of color were featured. Per Winston Duke’s comments to Entertainment Weekly at Savannah Film Fesival, Black Panther‘s inclusion of a vast black cast, each with a personality specific to them and talent to give to the film, displayed a unique equality to the actors on film that actors of color such as Duke hadn’t witnessed before. 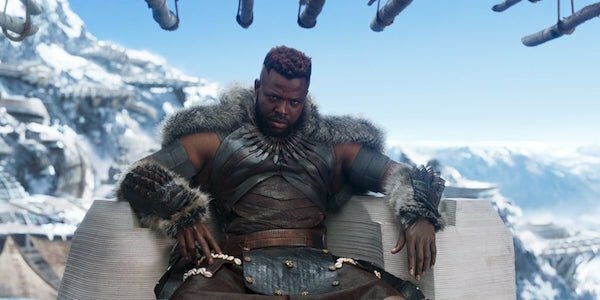 For playing Black Panther‘s M’Baku, Winston Duke actually made his feature film debut. Winston Duke previously starring in television as a recurring character of Domino in Person of Interest along with appearances in Law & Order: Special Victims Unit, The Messengers and Modern Family. The actor was a drama student at Yale with co-star Lupita Nyong’o back when The Avengers came out in 2012, unaware the two would star in a Marvel film together some years later. Soon Duke will be starring in Jordan Peele’s upcoming film Us with Nyong’o, following the director’s incredible success with his first directorial project Get Out. While M’Baku was originally written in 1969 as an offensive character known as “Man Ape,” the writers of Black Panther took the opportunity to tell a story of M’Baku as the head of a religious minority instead. Winston Duke’s role in the film was a scene stealer as the character went from an antagonist to T’Challa to an ally and friend. The character returned for the Battle for Wakanda in Avengers: Infinity War and was one of the lucky half of humanity to survive Thano’s snap. With Black Panther 2 is in the works, you check out everything we know so far about the upcoming sequel.